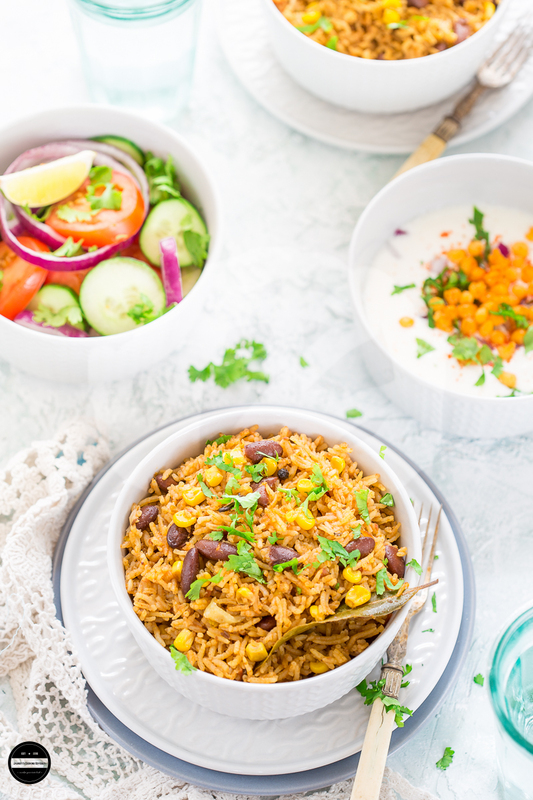 How to make Corn and Rajma Pulao Rice | Corn and Rajma Pulao Rice is a one-pot flavourful and vegan dish that can be served with any type of raita, salad and roasted papad for a well-balanced meal. It's a clear winner for those who love spicy and delicious rice dishes. 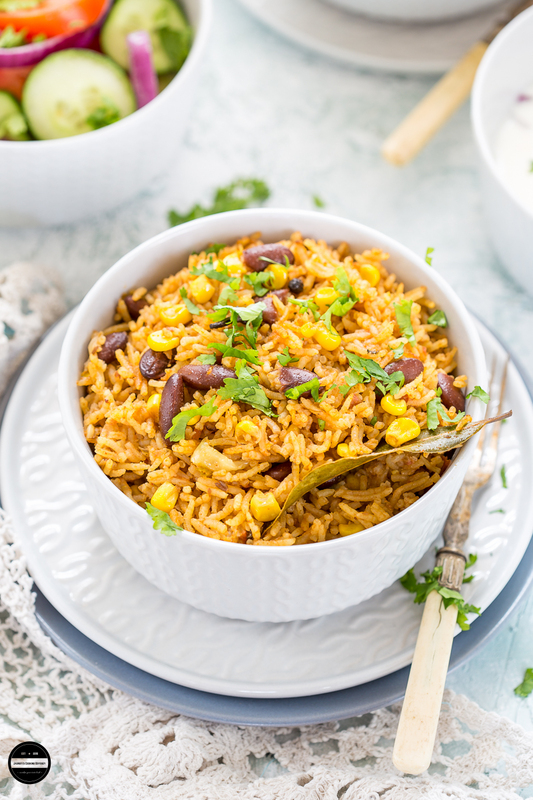 This hearty and comforting pulao rice is prepared with pre-cooked rajma/red kidney beans, frozen corn, rice and aromatic spices. It can be done under 30 minutes if red kidney beans are pre-cooked. This dish can be an ideal for lunch box too. To prepare this tasty and delicious rice, you don't need to prepare separately any red kidney beans/ rajma, if you have leftover Rajma masala, you can add that too. That's what I did, I had a small bowl of leftover Rajma Masala, the next day for lunch I prepared this amazingly delicious rice in no time at all. First I thought of adding mixed veg, but then when I spotted frozen sweetcorn bag in the freezer, all of a sudden I thought of my MIL's dish ' Jinjala ane Kasoli nu Saak' a very popular curry amongst East African Asian and is made especially on occasions such as wedding or parties. BTW Jinjala means red kidney beans and kasoli is sweetcorn. So I left the mixed vegetable bag, and picked up frozen sweetcorn instead :) I have used coconut milk to make rice smoother and creamier. I like my rice dishes cooked with some protein, so I don't just indulge in the carb. 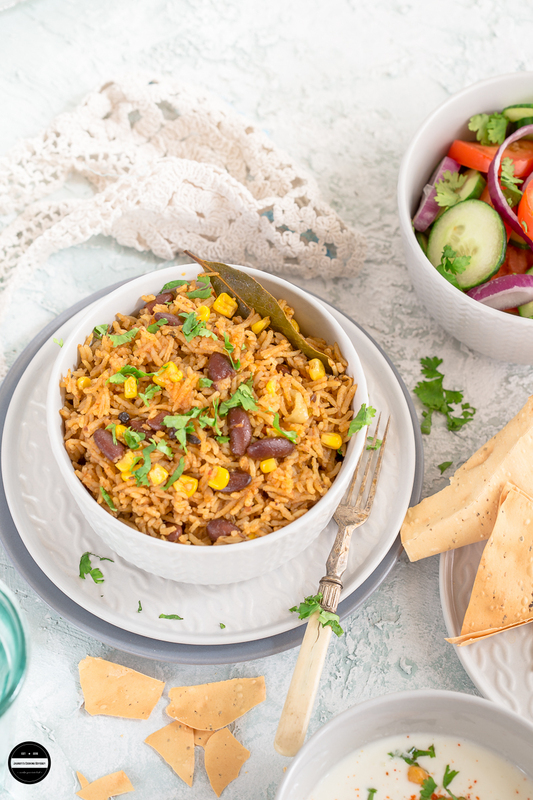 I know in this recipe, I've added corn but I made it up by eating more protein later that day :) Red kidney beans are a powerhouse of goodness with a great source of dietary fibre, protein and iron. If you are suffering from low haemoglobin, start incorporating Red kidney beans in your diet. 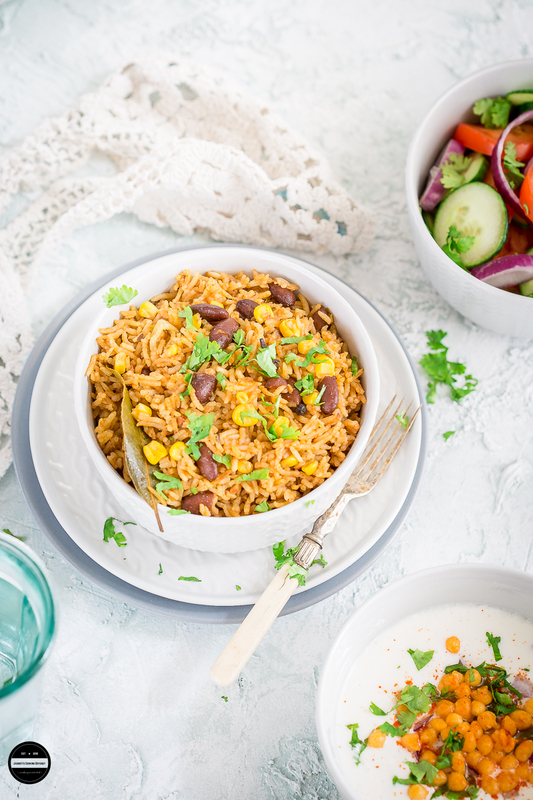 If you are looking for something spicy, delicious and easy to make over this weekend, then look no further and than this Corn and rajma Pulao. If you don't have rajma masala, use pre-cooked red kidney beans (Can will do, but drain all the water) Don't use just soaked red kidney beans. I have used brown basmati rice, but you can use normal basmati rice too. Heat oil in a big kadai or thick bottom pan, add cumin seeds and whole spices. Once they start crackling, add chopped onion fry until light brown. Add ginger-garlic paste and green chilli. Saute for few seconds, then add chopped tomatoes and let the mixture cook for another 2-3 minutes. Add rajma and corn and mix well. Now add red chilli powder, turmeric powder, ground cumin and coriander and garam masala if using. Let the masala cook for another minute then add soaked rice and mix well. Add coconut milk ( if using) and just enough water to cook the rice perfectly. Cover the pan with the lid and keep the heat on high for 3-4 minutes. Then turn the heat on low and let the rice cook in its own steam. Check the rice after 7-8 minutes, if it's done turn off the heat and leave it for another five minutes. If not add a couple of spoons of water and cook further. Gently mix and serve with salad, raita and roasted papad. This looks awesome!! I like taking rice bowls for lunch and may try this one. Yum!! Your images are gorgeous! I love every single one of them. Now I'm super excited to try your delicious rice recipe. Yum, yum! Thanks Confettia, please do and let us know how it turned out for you. This looks really delicious. It remind me of red beans and rice but less beans. Thanks Luci, yes similar recipe to rice and peas. This looks like a quick and hearty dish to serve on a busy weeknight. I love the idea of cooking the rice in coconut milk and adding plenty of spices. I bet that cinnamon adds a nice dimension to the dish. Great idea to go with corn and I like the idea of adding extra veggies if some are on hand. This looks so pretty and love all the flavors. What a healthy and flavorful meal, I can't wait to try it! what a delicious looking rice beans and corn so pretty I would have never thought of this combination of flavors with those two ingredients. Better than plain old white rice nice! I love rice dishes and this one looks delicious! I could eat this every day - it looks so good. Pulao looks delicious and irresistible.. my favourite one pot meal. Beautiful shot. Love the combo corn and Rajma. Boondi raita matches so well with this rice. Wow.. Interesting. Never tried it with rajma.. Looks so flavorful and tempting Jagruti. Delicious Share. What a great way to use leftovers! I like the Rajma and corn flavor combination as well! Yummy all around! what jagruti, looks inviting!!! a protein rich lunch recipe!!! Love the bright and clean pictures!!! This is a perfect one pot meal with all the flavours and goodness of coconut milk too. I am sure that this rajma and corn pulao must have tasted heavenly. Both makes a great combo in nachos so can imagine. Will try this one. My kids will go really love it. Never tried corn and rajma together in a dish. Your pulao sounds flavorful and so appealing ..lovely one pot comfort dish . Corn and Rajma Pulao sounds interesting.Your pics make it more tempting. 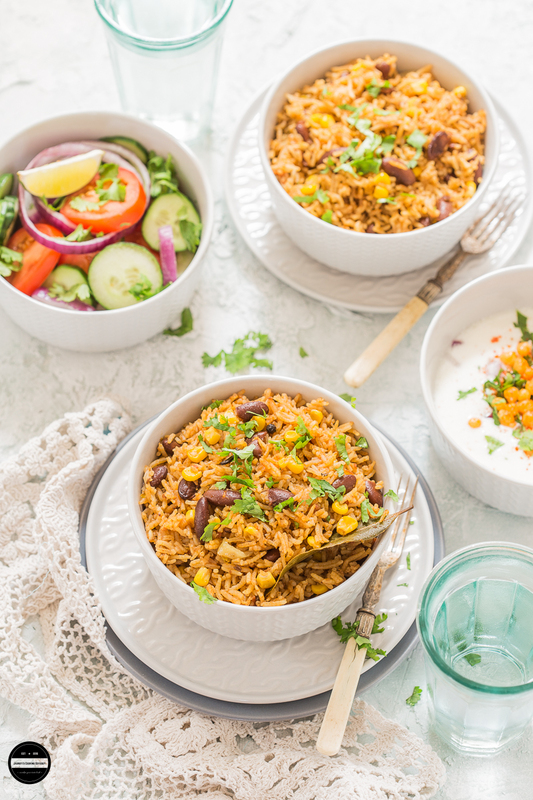 Corn and rajma pulao looks very inviting Jagruti and I love the bright and airy pics, makes it more tempting.